A Google research team built an AI tool reminiscent of “Guitar Hero” which lets non-musicians improvise on the piano in real-time using just eight buttons. The tool is called Piano Genie, and was built by training a neural network on performances from an international competition. The team behind Piano Genie was comprised of three researchers, including a Google intern for whom Piano Genie was his internship project. Self-playing pianos have existed for a while now, but now a team at Google have effectively built a self-improvising piano. A team of three at Google’s Magenta research project were inspired by “Guitar Hero” to build a tool to let non-musicians make music using a simplified set of buttons. The team was made up of two Google AI researchers and one from Deepmind, Google’s British AI firm. To create Piano Genie, the team built a neural network and trained it on roughly 1,400 performances from the International Piano e-competition. They then had to build encoders to map this onto the controller’s eight buttons. They hooked the controller up to a self-playing piano, and you can listen to the results for yourself. Piano Genie was Chris Donahue’s internship project. “I really wanted to design a tool that we could give to someone who doesn’t know how to play, and they’d be able to create music with some kind of intention,” he told the Verge. The team’s research emphasises the speed with which Piano Genie can produce its improvisations. “Genie has an immediacy not shared by other work in this space; sound is produced the moment a player interacts with our software rather than requiring laborious configuration,” they write in the research paper. 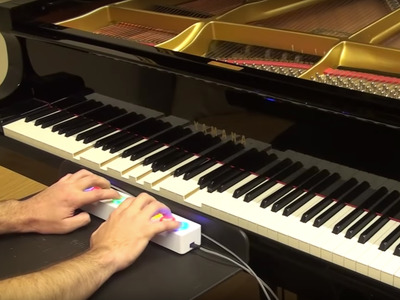 You don’t need a modded piano with big glowing buttons to use Piano Genie, the team made the tool available on the web, so anyone can play around with it. This reporter played on Piano Genie, but was unable to get a sound anywhere near as good as in the demo videos.